Asia‐Pacific gold development company Nusantara Resources Limited (Nusantara, ASX: NUS) is pleased to advise that drilling has commenced at the Puncak Selatan near-mine prospect at its 100%-owned Awak Mas Gold Project (Project) located in South Sulawesi, Indonesia. The Puncak Selatan prospect was identified as a priority drill target given the significant surface mineralisation and its proximity to the planned Awak Mas open pit. PS21; 12m @ 1.7 g/t Au (incl 8m @ 2.3 g/t Au). 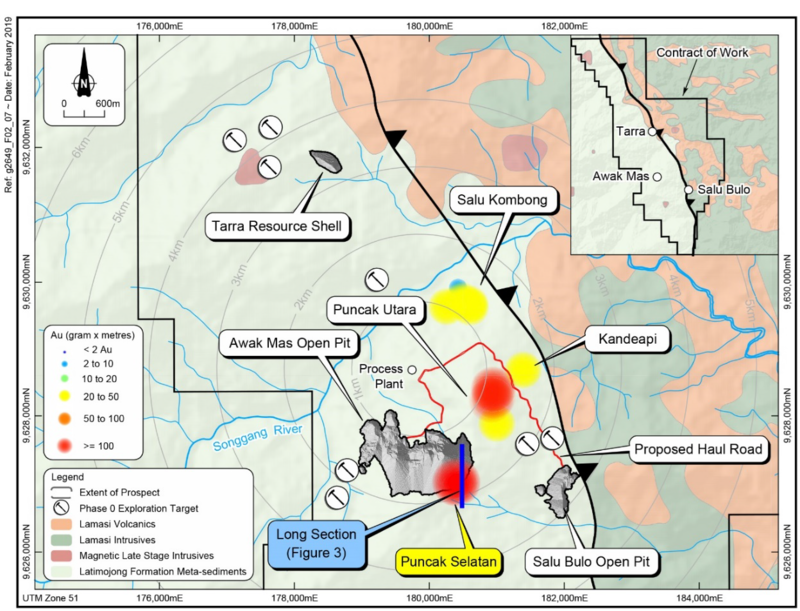 The Puncak Selatan prospect was identified as a priority drill target given the significant surface mineralisation and its proximity to the planned Awak Mas open pit (Figure 2). The drilling program will test the possibility that the Awak Mas eastern mineralisation (Lengket domain) could extend up-dip as the Puncak Selatan prospect surface expression (Figure 3) and provide information to assist in confirming the geological model in the near-mine area. An initial six-hole drill program totalling 1,600 metres at the Puncak Selatan prospect (Figure 4) has commenced. “The commencement of near mine exploration is the first step in identifying additional resources that have the potential to be processed at the proposed processing plant and add further value to the long life, low cost Awak Mas Gold Project. The identification of significant mineralisation at the Puncak Selatan prospect and the near-mine area potential to extend the Awak Mas open pit, has made this a high priority drill target. Our work continues to define the geological setting of the Contract of Work area and together with a planned geophysics program will increase the possibility of further discoveries that will enhance the Project” commented Nusantara’s Managing Director and CEO, Mike Spreadborough.